Home » news » William Cowley joins the Magna Carta 800 Celebrations! William Cowley joins the Magna Carta 800 Celebrations! Posted by Adrian on July 29, 2013 in news | Comments Off on William Cowley joins the Magna Carta 800 Celebrations! 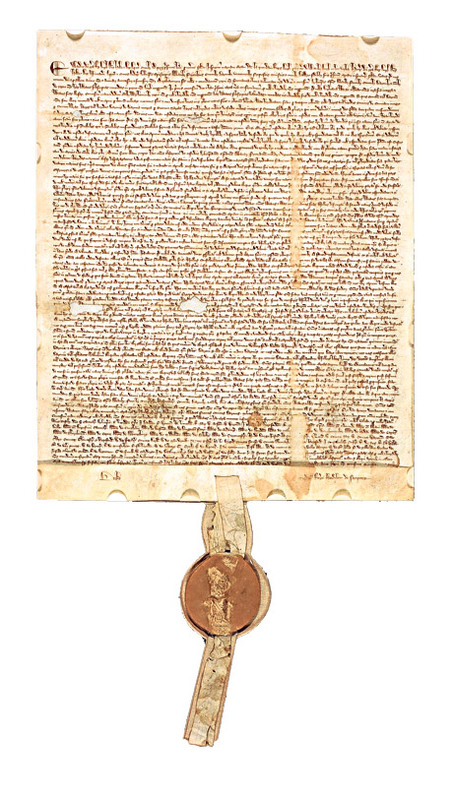 William Cowley are delighted to announce our involvement in ‘Magna Carta 800’, the celebrations marking 800 years of the sealing of the Magna Carta in 1215. The company was proud to provide exhibits for the recent Magna Carta exhibition at St Albans Cathedral. Our Parchment Making Demonstration on Sunday 25th August attracted a lot of interest from visitors. See our report on the day, also in the ‘News’ section. The St Albans event will be followed over the next 3 years with a series of exhibitions and medieval events in other parts of the country, commemorating ‘Magna Carta 800’. See the link below to the ‘Magna Carta 800’ website for more details. There will be rare opportunities to see one of the original 1215 Magna Carta, with its 63 clauses scribed in tiny abbreviated text onto a single sheet of sheepskin parchment! 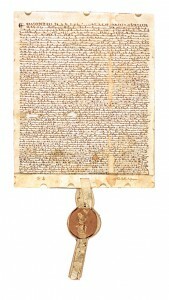 The Magna Carta is one of the most important documents ever created. Its 800th anniversary gives testament to the longevity and beauty of parchment. It is with great pride that William Cowley, as the last remaining manufacturer of parchment and vellum in the land, will contribute to the celebrations. Many of you will know that William Cowley have been producing the World’s finest parchment since 1870, and is now the only producer in the UK. A great many of our national historic and royal documents are written or printed on parchment, with the Magna Carta one of the most famous. In 1986 the Domesday Book (originally bound in two parts) was repaired and rebound as five separate volumes using William Cowley vellum. Not only does the William Cowley company have a long history of its own but we are proud to have contributed to the making, restoration and preservation of many highly prestigious national historical, cultural and royal documents, for over a century. If you were unable to attend the St Albans event, and are interested in finding out more about our parchment and vellum products please feel free to contact me with any queries.. Since 1870, over four generations, William Cowley has been producing genuine, hand-crafted, Parchment and Vellum of the finest quality, using time-honoured methods largely unchanged for centuries. Our natural products can literally last for centuries which is unlikely with so called ‘parchment paper’ imitations! We are proud to supply our traditional products to calligraphers, printers, artists, bookbinders and drum makers among others the world over. We always welcome new enquiries from around the Globe. For many years William Cowley has also featured a high quality vellum covering service for a wide range of bespoke contemporary furniture, wall covering panels and door panels. Our printing service for prestigious documents enables organisations or the general public to have new or existing documents such as Certificates or Family Trees printed on genuine Parchment. We pride ourselves on the personal service we offer to both new and established customers. Please do not hesitate to phone or email us for advice, a quotation, or to make an order; we warmly welcome enquiries from all corners of the globe.